Today's Mars Photo of the Day is shows four views of Mars taken by the Hubble Space Telescope (HST) between April 27 and May 6 1999, when Mars was only 87 million kilometers from Earth. At that distance the telescope's Wide Field and Planetary Camera 2 was able to see features on Mars as small as 19km wide. 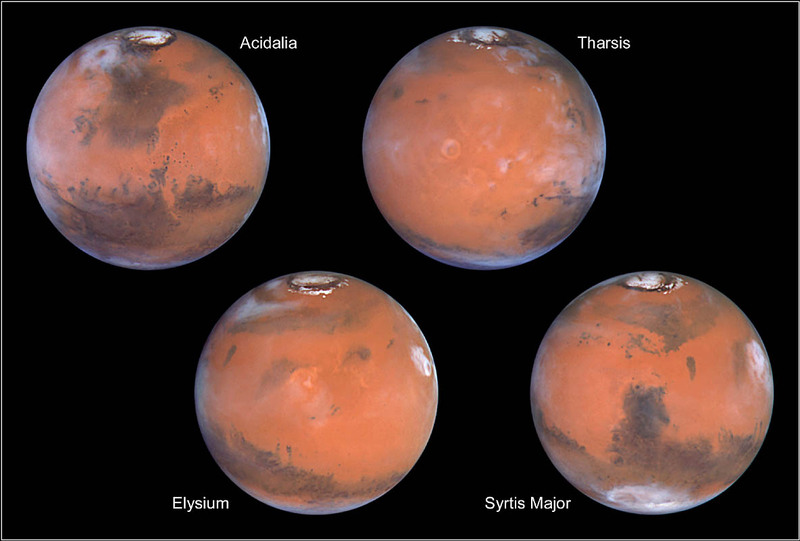 Each of the images shows Mars as it completes a quarter of its daily rotation, so together the images show Mars in its entirety. Each image is centered on a different region, all of which are labeled. Details on each of the photos can be found by clicking on the image. Doing so will direct you to the official caption from NASA.